MC Lyte, Chuck D are among celebrities teaming with Smithsonian for Hip-Hop and Rap anthology with over 120 tracks funded by Kickstarter. Music legends MC Lyte, Chuck D and Questlove of The Roots are among celebrities who’ve teamed with the Smithsonian on a forthcoming rap and hip-hop anthology that’s being touted as a “powerful cultural statement” about the community’s influence on American and global culture. A $250,000 crowdfunding campaign is underway on Kickstarter to raise money for the “Smithsonian Anthology of Hip-Hop and Rap,” which will celebrate hip-hop, a distinctly African-American music and art form that began in the 1970s in the Bronx. The compilation will include nine CDs, more than 120 tracks and a 300-page book with extensive liner notes and essays by various artists, produced and released by Smithsonian Folkways Recordings. The project will also feature never-before-published photos culled from the Smithsonian’s National Museum of African American History and Culture’s vast collection. The Smithsonian anthology is being produced and released by Smithsonian Folkways Recordings, helmed by director/curator, Huib Schippers; he’s coordinating the project with Dwandalyn Reece, the museum’s music curator. Besides Chuck D, MC Lyte, and Questlove, the museum’s anthology committee also includes 9th Wonder, music industry veterans, scholars, and authors. The anthology is being billed as the first collection to include music from every major label and dozens of independent label recordings. It will explore issues and themes in rap history, while providing a window into hip-hop’s impact on the music and cultural traditions of the African diaspora. MC Lyte, legendary lyricist and DJ, spoke exclusively to NBC News by phone from Los Angeles and said she’s “honored” to serve on the committee developing the anthology. The Brooklyn native was 17-years-old when her rap album “Lyte As A Rock” debuted in the late ’80s. She is the first female rapper to ever receive a gold single, and her 1993 classic anthem, “Ruffneck,” was nominated for a Grammy for Best Rap Single. Now in her forties and a newlywed, she juggles her entertainment career with community advocacy and philanthropy. Her nonprofit, Hip Hop Sisters Foundation, has awarded annual college scholarships to African American youth, most attending HBCUs. The campaign will run through Nov. 15 and has raised close to $195,000 as of Friday. Donors will have a chance to get the anthology before it arrives in stores, and at a reduced cost. 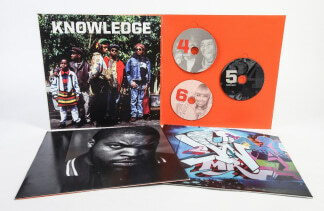 Donors can receive rewards through the Kickstarter campaign, including a set of hip-hop trading cards to a tour of the National Museum of African American History and Culture led by a curator and Questlove. One can also receive a one-of-a-kind pair of Adidas hand-painted by Cey Adams, a renowned visual artist and founding creative director of Def Jam who designed the anthology. The anthology is expected to be released December 2018.